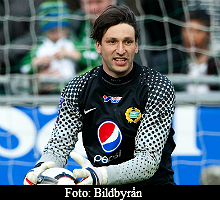 A goalie that plays with a great amount of calmness. Made a shootout against Trinidad/Tobago in the 2002 World Cup. Were on his way to something very big when he got injured just before christmas 2002. After that he hasnt been able to reach the same level as before the injury. Were seen as a great addition to the Hammmarby squad but a big amount of injuries has ruined his chances of having a great career.